For some reason my gums have become sensitive to whitening toothpastes, in particular abrasive types, so I've been on the lookout for a product I can use instead of an everyday toothpaste to remove stains and keep my teeth looking bright and healthy. Why my teeth stain is a bit of a mystery to me as I no longer smoke, don't drink tea, coffee or red wine, and generally take good care of my mouth, so while I can't seem to prevent the discolouration I was really hoping the iWhite Instant Whitening Kit* would give me the lovely bright smile that I previously enjoyed. The iWhite kit contains 10 hygienically packaged tooth trays filled with a Film-Crystallised Calcium technology active gel (no hydrogen peroxide here), which aims to instantly whiten teeth by up to 8 shades, and can be used occasionally or on 5 consecutive days to remove stains and strengthen the upper and lower teeth. The iWhite trays are really simple to use as they're prefilled and individually packaged, so you just need to take them out of the sachet and pop them in for 20 minutes over gently brushed teeth. As the trays are one size I was a bit worried they'd be big and bulky, as before the first go I had hockey gumshields from school in my mind, but the rubber is thin and flexible so they're actually really comfortable and I can fit both top and bottom in with ease. The instructions warn that biting too hard can cause the active gel to ooze out from the trays, but I didn't experience that problem and actually would have preferred a bit more gel in the tray- I seem to get the most staining by my gum-line, and I found I really had to wiggle the trays to get a good enough coating that far up the tooth. The gel itself has a slightly minty but not strong taste and, while the process isn't unpleasant, 20 minutes is about the maximum I'd want to have it in my mouth before needing a good rinse with water. As my teeth started off quite stained I decided to use the use the trays on 5 consecutive days rather than once in a while, for what iWhite calls 'even more astonishing' results, and happily didn't experience any tooth sensitivity from the more intensive treatment. 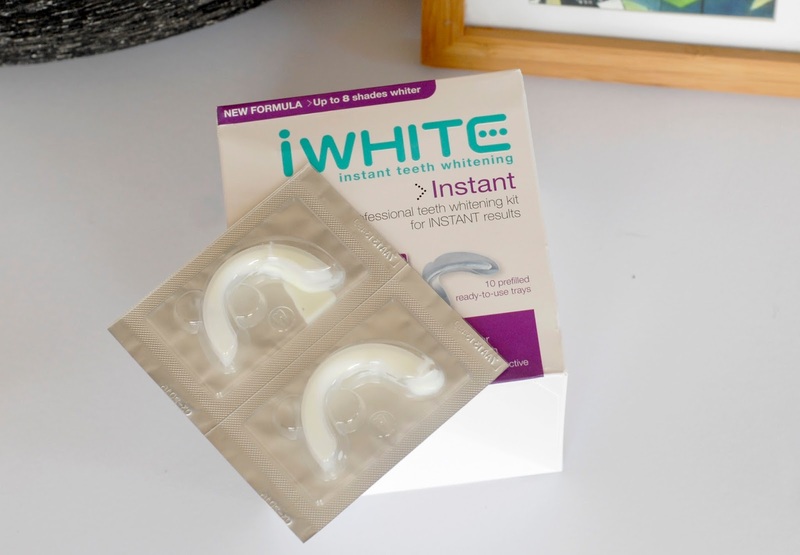 iWhite claim that their innovative active gel can whiten teeth up to 8 shades instantly, which is an impressive thought but one that I found a little bit arbitrary without the inclusion of some kind of visual scale to show the amount of difference between each shade. I was really pleased with the ease of use of the trays, but a little less so with the results. After the first go there was a small change in colour, and while my teeth were definitely whiter at the end of the 5 day treatment period, I'm not convinced that I could decidedly call them white. They have changed in shade overall, but the staining by my gums hasn't evened out with the rest of my teeth quite as much as I would've liked. You can see my before and after photos below, the lipstick in both is Rimmel Lasting Finish by Kate in 16. I think starting colour will be a big factor in the results gained from this whitening kit, as well as whether the staining is uniform or worse in certain areas, but what might spur me on to buy another box from iWhite rather than another brand is that it contains highly soluble calcium to help strengthen teeth rather than wearing away at them like some other tooth whitening techniques. I think if you have even discolouration that isn't too severe then this kit is well worth trying out, especially since it isn't abrasive so won't damage the teeth, as the results on your smile will probably be a bit brighter and whiter than mine! The iWhite Instant Whitening Kit is available from Boots for £29.95 or Look Fantastic for £21. that is a pretty good difference, I've never used an intense whitener because I'm scared they'll make my teeth really sensitive but this sounds better and more suited for me, will definitely have a look next time i'm in boots. You can definitely see a difference there! Looks like a really good product. I've been looking for a whitening treatment for a while I might check this out. I normally buy Crest Whitening Strips on eBay (as they are only available in the US) but they contain hydrogen peroxide so I should probably stop using those! The difference is great (love the lipstick too! ), I've been using a lot of BlanX products but you've converted me to this! Definitely need to give this a try, shame about only getting 5 pairs of moulds though! Thanks for your review about iwhite instant whitening kit. Really, Nice review!